G-WorldWide Entertainment Sues Kiss Daniel For Breach Of Contract! Home / News / G-WorldWide Entertainment Sues Kiss Daniel For Breach Of Contract! Anidugbe Oluwatobi Daniel popularly known as Kiss Daniel has been charged to court by the management of G-Worldwide Entertainment with a case of the singer breaching the seven years contract he signed with the company in 2013 which has not expired. In the notice received, the management stated that Kiss Daniel has been dealing with organizations and individuals with his stage name which is still owned by G-Worldwide Entertainment and also agreeing to perform singles from his album ‘New Era’ and his yet to be released albums ‘Evolution’which contains songs like Yeba, For You, Senorita, and Sofa, songs that are also parts of the properties of G-Worldwide as that is part of the deal that was agreed on by both parties in 2013. Hence G-worldwide is legally fighting Kiss Daniel stating that the singer has breached the deal by not just starting his label, FlyBoi Entertainment but also getting a new management when he still has an ongoing contract with them. 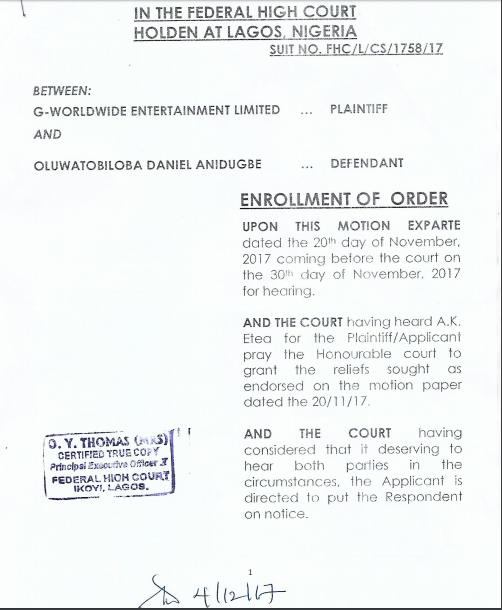 Going further, any agreement that needs to be done between Kiss Daniel and any individual or organization has to seek the permission of G-Worldwide Entertainment until the case which has been adjourned by the Federal High Court to 9th of January 2018 is resolved. The attention of G-Worldwide Entertainment Limited (‘the Company’) has been drawn to acts by Oluwatobiloba Daniel Anidugbe (alias ‘Kiss Daniel’), who recently has been making publications on different print media and social media platforms soliciting for bookings to perform songs from his album NEW ERA and EVOLUTION. Mr. Anidugbeexecuted a 7-year Recording and Artist Management Contract (’the Contract’) with the Company in 2013 and which Contract is still subsisting. Contrary to the express provisions of the Contract, Mr. Anidugbehas taken steps to appoint a new manager, solicited for bookings and has continued to negotiate and enter performance agreements in respect of the songs from the album NEW ERA, and EVOLUTIONwhich is set to be released soon containing singles such as YEBA, FOR YOU, SENORITA, SOFA, and others,both produced under the Contract, including using the stage name ‘Kiss Daniel’ without the Company’s prior consent and permission. Further thereto, the Company has approached the Federal High Court, Lagos in suit no. FHC/L/CS/1758/2017 between G-WORLDWIDE ENT. LIMITED Vs OLUWATOBILOBA DANIEL ANIDUGBE to affirm its rights over the intellectual property under the Contract i.e. copyrights over the songs in both albums, and rights over the stage name: ‘Kiss Daniel’. By an application dated 20th November 2017, the Company sought interim orders of injunction, and other further orders as the Court may deem fit to make, againstMr. Anidugbe, retraining the Artiste’s further distribution, publication, or performance of these songs, or negotiating or entering any agreement thereof without the consent or permission of G-Worldwide Entertainment Ltd. 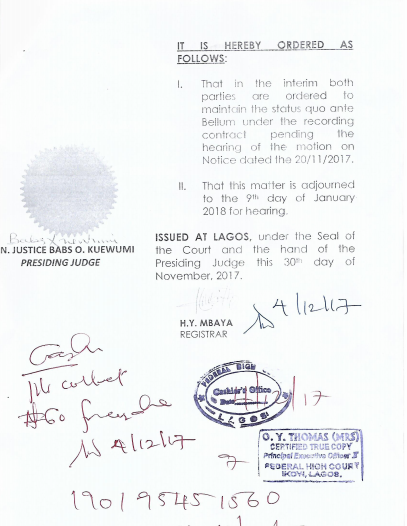 The general public and the whole world is hereby put on notice that on the 30th day of November 2017, the Federal High Court made an order that status quo ante bellum under the Contract, be maintained by the parties, pending the hearing and determination of the motion on notice filed in the suit. The import of the Order being that the state under which the parties existed under the Contract should be preserved until the Court makes a determination of the motion on notice filed by the Company. All and any dealings in respect of the upload, distribution, and or performance of any of the songs, as well as the use or exploitation of the name ‘Kiss Daniel’ can therefore only be entered or made with the prior written consent and permission of the Company as provided under the Contract. The general public and the whole world is further cautioned that as the matter is now before a Court of law (subjudice), and following the Order to maintain status quo, any unauthorized upload, distribution, exploitation, performance, sales, and use of the songs (from the NEW ERA and EVOLUTION albums), or stage name ‘Kiss Daniel’, in any show, event, downloading or streaming platform,will be in violation of the Order of the Federal High Court. Anyone who does or continues to do so shall be liable as an accomplice for contempt of court, and the full weight of the law will be brought against that person as a contemnor.